Chocolate dipped cashew granola bars! Chewy no-bake cashew granola bars, dipped in chocolate! 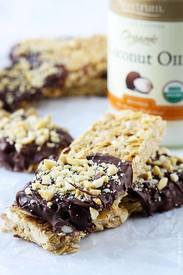 Made with coconut oil and no refined sugar! I can be a bit lazy when it comes to breakfast. You’d think that being a food blogger would mean that I am eating a gourmet omelet, or eggs benedict over toast every morning. Or at the very least a stack of pancakes hot from the griddle! Not the case. Most of the time it’s a grab-and-go type of thing. In which case it’s a usually a granola bar in my hand when I run out the door.